The Bayes factor test is an interesting thing. Some Bayesians advocate it unequivalently, whereas others reject the notion of testing altogether, Bayesian or otherwise. This post takes a critical look at the Bayes factor, attempting to tease apart the ideas to get to the core of what it’s really doing. If you're used to frequentist tests and want to understand Bayes factors, this post is for you. B10 : = p(D|H1) p(D|H0). If this ratio is large, we can conclude that there is strong evidence for the alternative hypothesis. In contrast, if the inverse of this ratio is large, we have evidence supporting the null hypothesis. The deﬁnition of what is strong evidence is subjective, but usually a Bayes factor of 10 or more is considered suﬃcient. Although Bayes factors are sometimes used for testing simple linear regression models against more complex ones, by far the most common test in practice is the analogue to the frequentist t-test, the Bayes factor t-test. Under the assumption of normality with unknown variance, it tests a null hypothesis of zero mean against non-zero mean. This test is implemented in the BayesFactor R package with the ttestBF method. For the pairwise case it can be invoked with bf <- ttestBF(x = xdata, y=ydata). For a non-pairwise test just x can be passed in. Statistical details of the test To apply the test we must formally deﬁne the two hypotheses in the form of statistical models. Jeﬀreys’ book is very pragmatic, and the modelling choices for this test reﬂect that. Since this is a t-test, we of course assume a normal distribution for the data for both hypothesis, so it just remains to just deﬁne the priors on it’s parameters in both cases. We have essentially 3 parameters we have to place priors on: the mean μ of the alternative, the variance under the alternative σ12 and the variance under the null σ02. The μ under the null is assumed to be 0. We have to be extremely careful about the priors we place on these parameters. Reasonable seeming choices can lead to divergent integrals or non-sensical results very easily. We discuss this further below. Variance Because the variance appears in both the numerator and denominator of the Bayes factor (the null and the alternative), we can use a “non-informative” improper prior of the form p(σ2) = 1∕σ2 for both. This prior causes the marginal likelihood integrals to go to inﬁnity, but this cancels out between the numerator and denominator giving a ﬁnite value. Mean The choice of a prior for the mean is a little more subjective. We can’t use an improper prior here, as the mean prior appears only in the numerator, and without the convenient cancelation with factors in the denominator, the Bayes factor won’t be well deﬁned. Jeﬀreys argues for a Cauchy prior, which is just about the most vague prior you can use that still gives a convergent integral. The scale parameter of the Cauchy is just ﬁxed to the standard deviation in his formulation. The BayesFactor package uses 0.707 times the standard deviation instead as the default, but this can be overridden. What are the downsides compared to a frequentist t-test? The main downside is that the BF test is not as good by some frequentist measures than the tests that are designed to be as good as possible with respect to those measures. In particular, consider the standard measure of power at γ: the probability of picking up an eﬀect of size γ under repeated replications of the experiment. Depending on the eﬀect size and the number of samples n, a Bayesian t-test often requires 2-4 times as much data to match the power of a frequentist t-test. Implementation details The Bayes factor requires computing marginal likelihoods, which is a quite distinct problem from the usual posterior expectations we compute when performing Bayesian estimation instead of hypothesis testing. The marginal likelihood is just an integral over the parameter space, which can be computed using numerical integration when the parameter space is small. For this t-test example, the BayesFactor package uses Gaussian quadrature for the alternative hypothesis. The null hypothesis doesn’t require any integration since it consists of a single point. B10 ≈ 2 πnexp t2∕2. p(H1|D) p(H0|D) = ∫ p(D|1)p(1|H1)d1 ∫ p(D|0)p(0|H0)d0 ⋅p(H1) p(H0). The ratio p(H1)∕p(H0) is not formally considered part of the Bayes factor, but it plays an important role. It encodes your prior beliefs about the hypotheses. If you are using Bayes factors in a subjective fashion, to update your beliefs in a hypothesis after seeing data, then it is crucial to properly encode your prior belief in which hypothesis is more likely to be true. However, in practice everybody always takes this ratio to be 1, following the ideals of objective Bayesian reasoning, where one strives to introduce as little prior knowledge as possible into the problem. If your writing a scientiﬁc paper, it’s reasonable to use 1 as anybody reading the paper can apply there own ratio as a correction to your Bayes factor, reﬂecting there own prior beliefs. The prior ratio of the hypotheses plays an interesting part in the calibration of the Bayes factor test. One way of testing Bayes factors is to simulate data from the priors, and compare the empirical Bayes factors over many simulations with the true ratios. This involving sampling a hypothesis, H0 or H1, then sampling then D. If the probability of sampling H0 and H1 is not equal at that ﬁrst stage, then the observed Bayes factor will be oﬀ by the corresponding p(H1)∕p(H0). This is somewhat of a tautology, as we are basically just numerically verifying the Bayes factor equation as written. Nevertheless, it shows that if the priors on the hypotheses don’t reﬂect reality, then the Bayes factor won’t either. Blind application of a Bayes factor test won’t automatically give you interpretable “beliefs”. The dependence of Bayes factors on the parameter priors p(1|H1) and p(0|H0) is really at the core of understanding Bayes factors. It is a far more concrete problem than the hypothesis likelihoods, as there is no clear “objective” choices we can make. Additionally, intuitions from Bayesian estimation problems do not carry over to hypothesis testing. where t = x̄(n − 1)∕s2 is the standard t-statistic of the data. The large ν that was chosen with the intent that it would be ’non-informative’ (i.e. minimally eﬀect the result) turns out to directly divide the BF! Because the ﬂat prior appears in the numerator only there is no clear scaling choice for it, so this expression is not in any sense calibrated (Several approaches to calibration appear in the literature, see Robert ). ≈ 2 πn 1 + t2 n exp t2∕2. The 1 + t2 n part can also be written 1 + x̄ s2 in terms of the known standard deviation and the empirical mean, and clearly it is constant asymptotically; the expression on the whole scales similarly as in the unknown variance case. The eﬀect of this diﬀerence is that for large sample sizes, a frequentist test can reject the null with small p (say p = 0.05), while a BF t-test run on the same data can strongly support the null hypothesis! As a concrete example, if we generate n = 50,000 synthetic data points with mean 2∕50000, variance 1, then the BF t-test yields 0.028 for the alternative hypothesis (i.e. 36:1 odds for the null being true), whereas a frequentist t-test rejects the null with p = 0.0478 (two-sided test). Detecting small eﬀects requires a large sample size, and the Bayesian t-test greatly prefers the null hypothesis over that of a small eﬀect. This is usually described positively as a Occam’s razor eﬀect, but it does have real consequences when we are attempting to ﬁnd true small eﬀects. Essentially, the BF test will require much more data pick up a small eﬀect then a corresponding frequentist test. Often, this is viewed from the opposite side; that frequentist tests too easily reject the null hypothesis for large sample sizes. This is more of an issue when testing more complex models such as linear regressions with multiple coeﬃcients. Unless the data was actually generated from a linear equation with Gaussian noise, large samples will inevitably reject simple null models. This is in contrast on simple point null hypothesis testing, where we can appeal to asymptotic normality. Here we attempt to answer the following question: are the properties of the default Bayes factor test indicative of BF tests in general? As we see it, there are two main ways to modify the test: We can use a non-point hypothesis as the null, or we can change the alternative hypothesis in some fashion. We discuss these possibilities and their combination separately. The default Bayes factor t-test is formulated from a objectivist point of view: it’s designed so that the data can “speak for its self”, the priors used are essentially as vague as possible while still yielding a usable test. What about if we choose the prior for the alternative that gives the strongest evidence for the alternative instead? This obviously violates the likelihood principle as we choose the prior after seeing the data, but it is nevertheless instructive in that it indicates how large the diﬀerence between point NHST tests and BF tests are. A reasonable class of priors to consider is those that are non-increasing in terms of || , as they have a single mode at = 0. We discuss other priors below. Table 1 shows a comparison of p-values, likelihood ratios from the Neyman-Pearson likelihood ratio test, and a bound on BFs from any possible prior of this form. It is immediately obvious that according to this bound, any reasonable choice of prior yields much less evidence for the alternative then that suggested by the p-value. For example, the diﬀerence at p=0.001 is 18 fold, and the diﬀerence is larger for smaller p.
Table 1: Comparison of methods for point-null normal data tests, reproduced from Berger and Wolpert . p(D| = 0) p(D| = ̂). This ratio is simplify the Neyman-Pearson likelihood ratio for composite hypothesis, and it’s values are also shown in Table 1. This values are still more conservative than p-values by a factor of 2-5. Note that in a Neyman-Pearson test such as the frequentist t-test, this ratio is not read-oﬀ directly as an odds ratio as we are doing here; that’s why this NP odds ratio doesn’t agree directly with the p-value. The interesting aspect of multi-modal priors is that they allow you to formulate a test that is more powerful for ﬁnding evidence of the null hypothesis. It can be shown that under the default BF t-test, evidence for the null accumulates very slowly when the null is true, where as evidence for the alternative accumulates exponentially fast when the alternative is true. Multi-modal priors can be formulated that ﬁx this imbalance [Johnson and Rossell, 2010]. One simple case is a normal or Cauchy prior with a notch around the null = 0 set to have low probability. If we go a step further and consider the limits of sequences of improper priors, the Bayes factor can take essentially any value. Some particular “reasonable” sequences actually yield values very similar to t-test’s p-values [Robert, 1993] as their posterior probabilities, at least between 0.1 and 0.01. Their construction also places 0 probability mass in the neighborhood of the null point in the limit, so it is similar to the multi-modal priors discussed in the previous paragraph. Although this improper prior does actually avoid Lindley’s paradox, it is more of a theoretical construction; it is not recommend in practice, even by it’s discoverer [Robert, 1993]. As discussed above, when restricting ourselves to well behaved proper priors, “Lindley’s paradox” as such can not be rectiﬁed by a careful choice of a proper prior on the alternative hypothesis. When one takes a step back and considers the consequences of this, Lindley’s paradox becomes much clearer, as a statement about objective priors rather than BF tests in general. Experimental design considerations are important in the choice of a prior, and the Bayesian justiﬁcation of the Bayes factor depends on our priors being reasonable. The choice of using a particular BF test is not a full experimental design, just as for a frequentist it is not suﬃcient to just decide on particular test without regard to the eventual sample size. It is necessary to examine other properties of the test, so determine if it will behave reasonably in the experimental setting in which we will apply it. So in eﬀect, Lindley’s paradox is just the statement that a poorly designed Bayesian experiment won’t agree with a less poorly designed frequentist experiment. Put another way, if the Bayes factor is comparing two hypothesis, both of which are unlikely under the data, you won’t get reasonable results. You can’t identify this from examining the Bayes factor, you have to look at the experiment holistically. The extreme case of this is when neither hypothesis includes the true value of . In such cases, the BF will generally not converge to any particular value, and may show strong evidence in either direction. It is illustrative to discuss an example in the literature of this problem: a high proﬁle case where the Bayesian and frequentist results are very diﬀerent under a default prior, and more reasonable under a subjective prior. One such case is the study by Bem  on precognition. The subject matter is controversial; Bem gives results for 9 experiments, in which 8 show evidence for the existence of precognition at the p = 0.05 level! This obviously extraordinary claim lead to extensive examination of the results from the Bayesian view-point. In Wagenmakers et al. [2011a], the raw data of Bem  is analyzed using the default Bayesian t-test. They report Bayes factors towards the alternative (in decreasing order) of 5.88, 1.81, 1.63, 1.05, 0.88, 0.58, 0.47, 0.32, 0.29, 0.13 . So only one experiment showed reasonable evidence of precognition (5.88:1 for), and if you combine the results you get 19:1 odds against an eﬀect. In contrast, Bem et al. performed a Bayes factor analysis using informative priors on eﬀect sizes, uses values considered reasonable under non-precognitive circumstances. The 3 largest Bayes factors for the existence of precognition they got were 10.1, 5.3 and 4.9, indicating substantial evidence! The interesting thing here is that the vague prior used by Wagenmakers et al. [2011a] placed a large prior probability on implausibly large eﬀect sizes. Even strong proponents of ESP don’t believe in such large eﬀects, as they would have been easily detected in other past similar experiments. Somewhat counter-intuitively, this belief that ESP eﬀects are strong if they exist at all yields a weaker posterior belief in the existence of ESP! It should be noted that Wagenmakers et al. [2011b] responded to this criticism, but somewhat unsatisfactory in my opinion. Of course, even with the use of correct subjective Bayesian priors on the alternative hypothesis, these experiments are not suﬃcient to convince a skeptic (such as my self) of the existence of ESP! If one factors in the prior p(H1)∕p(H0) and updates their beliefs correctly, you may go from a 1:1-million belief in ESP existing to a 1:76 belief (if you use the naive combined BF of 13,669 from Bem et al. ). Most reasonable people would consider the chance that a systematic unintentional error was made during the experiments to be greater than 1 in a thousand, and so not update their beliefs quite as severely. Regardless, several pre-registered replications of Bem’s experiments have failed to show any evidence of precognition [Ritchie et al., 2012]. The general consensus in the literature is that single Bayes factors should not be reported. Instead the BFs corresponding to several diﬀerent possible priors for the alternative hypothesis should be reported. Only if the conclusions are stable for a wide range of priors can they be reported as deﬁnitive. If the results are not stable, then it must be argued why a particular prior, chosen subjectively, is the best choice. Bounds giving the largest or smallest possible Bayes factor over reasonable classes of priors, such as the bounds given in Berger and Jeﬀerys , can also be reported. The consideration of multiple possible priors is generally called “robust” Bayesian analysis. As we showed above, under essentially any point-null Bayes factor t-test, the results are much more conservative than frequentist t-tests on the same data. But is this indicative of BF tests in general? It turns out Bayes factor tests that don’t use point-nulls behave much more like their frequentists counterparts [Casella and Berger, 1987]. But ﬁrst, lets just point out that point-null hypotheses are fundamentally weird things. When we start assigning positive probability mass to single values, we move from the comfortable realm of simple distribution functions we can plot on a whiteboard, into the Terra pericolosa that is measure theory. As anybody who has done a measure theory course knows, common sense reasoning can easily go astray even on simple sounding problems. The “surprising” Occam’s razor eﬀect seen in point-null BF tests is largely attributable to this eﬀect. It can be argued that any prior that concentrates mass on a single point is not “impartial”, eﬀectively favoring that point disproportionately [Casella and Berger, 1987]. Applying one-sided tests in the frequentist setting is routine (in fact often advocated [Cho and Abe, 2013]), it is surprising then that their theoretical properties are very diﬀerent to two-sided tests. If we look at both Bayesian and frequentist approaches from the outside, using decision theory (with quadratic loss), we see a fundamental diﬀerence. For the one sided case, the Fisher p-value approach and obeys a weak kind of optimality known as admissibility [Hwang et al., 1992]: no approach strictly dominates it. In contrast, in the two-sided case neither the frequentist or the standard Bayesian approach is admissible, and neither dominates the other! What does this tell us about sequential testing settings? The use of Bayes factor tests is sometimes advocated in the sequential testing setting, as their interpretation is not aﬀected by early stopping. “Sequential testing” is when a test of some form of test is applied multiple times during the experiment, with the experiment potentially stopping early if the test indicates strong evidence of an eﬀect. Using frequentist tests sequentially is problematic; the false-positive rate is ampliﬁed and special considerations must be made to account for this. See my previous post for details on how to perform the frequentist tests correctly. 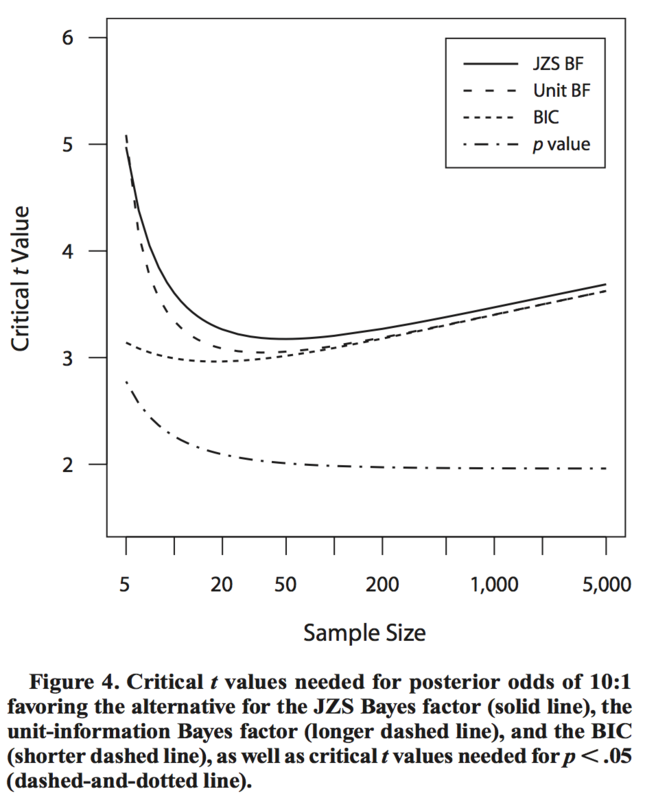 The interpretation of the Bayes factor in contrast is unaﬀected by early stopping. Naive application of a point-null BF test does seem to perform reasonable in a sequential setting, as it’s naturally conservative nature results in few false positives being detected. However, as we pointed out above, one-sided non-point null tests are equally valid, and they are not particularly conservative. Just applying one sequentially gives you high false-positive rates comparable to the frequentist test. The false-positive rate is a frequentist property, and as such it is quite unrelated to the Bayesian interpretation of the posterior distribution. Indeed, in most sequential A/B testing situations, such as website design tests, the one-sided non-point test seems the most reasonable, as the two hypothesis correspond more directly to the two courses of action that will be taken after the test concludes: Switch all customers to design A or design B. So, should I use a point null hypothesis? Here we start to move outside the realm of mathematics and start to meander into the realm of philosophy. You have to consider the purpose of your hypothesis test. Point-nulls enforce a strong Occam’s razor eﬀect, and depending on the purpose of your test, this may or may not be appropriate. The examples and motivation used for null hypothesis testing in the original formulation of the problem by Jeﬀreys came from physics. In physics problems testing for absolute truth is a much clearer proposition. Either an exotic particle exists or it doesn’t, there is no in-between. This is far cry from the psychology, marketing and economics problems that are more commonly dealt with today, where we always expect some sort of eﬀect, although potentially small and possibly in the opposite direction from what we guessed apriori. You need a real belief in the possibility of zero eﬀect in order to justify a point null test. This is a real problem in practice. In contrast, by using non-point null tests you will be in closer agreement with frequentist results, and you will need less data to make conclusions, so there is a lot of advantages to avoiding point null tests. It is interesting to contrast modern statistical practice in high energy physics (HEP) with that of other areas where statistics is applied. It is common practice to seek “ﬁve sigma” of evidence before making a claim of a discovery in HEP ﬁelds. In contrast to the usual p ≤ 0.05 requirements, the diﬀerence is vast. Five sigma corresponds to about a 1-in-1million p value. However, if you view the ﬁve sigma approach as a heuristic approximation to the point-null BF test, the results are much more comparable. The equivalent t statistic needed for rejection of the point null under the Bayesian test scales with the amount of data. HEP experiments often average over millions of data points, and it is in that multiple-million region where the rejection threshold, when rephrased in terms of the t statistic, is roughly ﬁve. Don’t use point-null Bayesian tests unless the point null hypothesis is physically plausible. Always perform a proper experimental design, including the consideration of frequentist implications of your Bayesian test. Try to use an informative prior if you are using a point null test; non-informative priors are both controversial and extremely conservative. Ideally show the results under multiple reasonable priors. Don’t blindly apply the Bayes factor test in sequential testing situations. You need to use decision theory. Daryl J. Bem. Feeling the future: Experimental evidence for anomalous retroactive inﬂuences on cognition and aﬀect. Journal of Personality and Social Psychology, 2011. Daryl J. Bem, Jessica Utts, and Wesley O. Johnson. Must psychologists change the way they analyze their data? a response to wagenmakers, wetzels, borsboom, & van der maas. 2011. James O. Berger and William H. Jeﬀerys. The application of robust bayesian analysis to hypothesis testing and occam’s razor. Technical report, Purdue University, 1991. James O. Berger and Luis R. Pericchi. Objective bayesian methods for model selection: Introduction and comparison. IMS Lecture Notes - Monograph Series, 2001. J.O. Berger and R.L. Wolpert. The Likelihood Principle. Institute of Mathematical Statistics. Lecture notes : monographs series. Institute of Mathematical Statistics, 1988. ISBN 9780940600133. URL https://books.google.com.au/books?id=7fz8JGLmWbgC. George Casella and Roger L. Berger. Reconciling bayesian and frequentist evidence in the one-sided testing problem. Journal of the American Statistical Association, 82(397):106–111, 1987. ISSN 0162-1459. doi: 10.1080/01621459.1987.10478396. Hyun-Chul Cho and Shuzo Abe. Is two-tailed testing for directional research hypotheses tests legitimate? Journal of Business Research, 66(9):1261 – 1266, 2013. ISSN 0148-2963. doi: http://dx.doi.org/10.1016/j.jbusres.2012.02. 023. URL http://www.sciencedirect.com/science/article/pii/S0148296312000550. Advancing Research Methods in Marketing. Jiunn Tzon Hwang, George Casella, Christian Robert, Martin T. Wells, and Roger H. Farrell. Estimation of accuracy in testing. Ann. Statist., 20(1):490–509, 03 1992. doi: 10.1214/aos/1176348534. URL http://dx.doi.org/10.1214/aos/1176348534. Harold Jeﬀreys. Theory of Probability. 1939. V. E. Johnson and D. Rossell. On the use of non-local prior desities in bayesian hypothesis tests. Journal of the Royal Statistical Society, 2010. Stuart J. Ritchie, Richard Wiseman, and Christopher C. French. Failing the future: Three unsuccessful attempts to replicate bem’s ‘retroactive facilitation of recall’ eﬀect. PLoS ONE, 2012. Christian P. Robert. A note on jeﬀreys-lindley paradox. Statistica Sinica, 1993. Christian P. Robert, Nicolas Chopin, and Judith Rousseau. Harold jeﬀreys’s theory of probability revisited. Statistical Science, 2009. Jeﬀrey N. Rouder, Paul l. Speckman, Dongchu Sun, Richard D. Morey, and Geoﬀrey Iverson. Bayesian t tests for accepting and rejecting the null hypothesis. Psychonomic Bulletin & Review, 2009. Eric Jan Wagenmakers, Ruud Wetzels, Denny Borsboom, and Han van der Maas. Why psychologists must change the way they analyze their data: The case of psi. Journal of Personality and Social Psychology, 2011a. Eric Jan Wagenmakers, Ruud Wetzels, Denny Borsboom, and Han van der Maas. Why psychologists must change the way they analyze their data: The case of psi: Clariﬁcations for bem, utts, and johnson (2011). Journal of Personality and Social Psychology, 2011b.